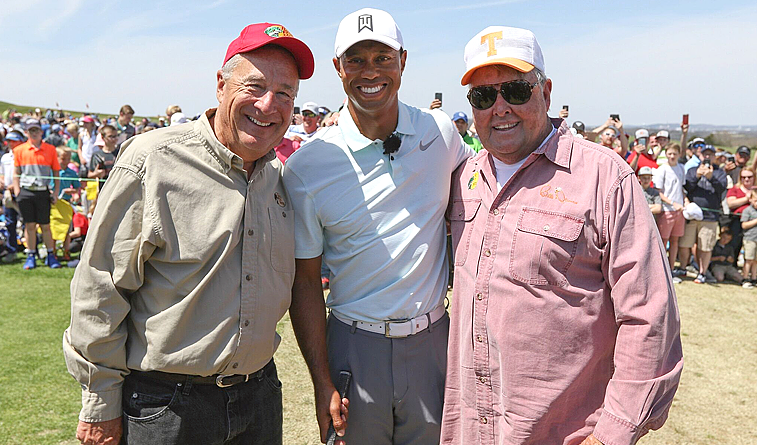 Photo: Johnny Morris, Tiger Woods and fishing legend Bill Dance. 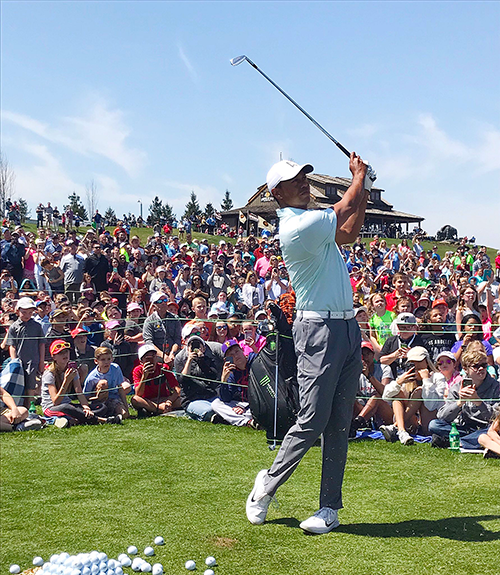 Tiger Woods drew thousands of young golfers and their parents to a clinic on the driving range at the Buffalo Ridge Golf Course in Hollister, Mo., part of the festivities for the Bass Pro Legends of Golf tournament which begins Thursday. Tickets are available at the gate or at www.bassprolegends.com. The tournament will incorporate the new Mountain Top course designed by Gary Player for the first time as well as the Top of the Rock course by Jack Nicklaus and Tom Fazio’s Buffalo Ridge. Woods has designed a course (Payne’s Valley) for Big Cedar and Bass Pro owner Johnny Morris that is being built and will open in 2019 and be the first public course he has designed. Golf Channel Coverage (all times CT): Friday: 11:30 – 2 p.m.; Saturday and Sunday: 2-5 p.m. The Gary Player Mountain Top short course has been added to the tournament rotation, which also includes Buffalo Ridge and Top of the Rock. This year’s 36-team field includes 12 members of the World Golf Hall of Fame: Ben Crenshaw, Hale Irwin, Tom Kite, Bernhard Langer, Davis Love III, Sandy Lyle, Colin Montgomerie, Mark O’Meara, Jose Maria Olazabal, Vijay Singh, Tom Watson and Ian Woosnam. In addition, each of the top-15 players in the Charles Schwab Cup will compete, including the winners of all seven tournaments this year: Jerry Kelly, Mark Calcavecchia, Joe Durant, Steve Stricker, Singh and Steve Flesch. In last year’s final round, Carlos Franco and Vijay Singh turned a seven-shot deficit into a one-shot victory after they carded a tournament-record score of 12-under 42 at Top of the Rock. Their 36-hole total of 15-under 93 was one shot better than three teams: first-round leaders Fred Funk / Jeff Sluman, Corey Pavin / Duffy Waldorf, and Paul Goydos / Kevin Sutherland. For Franco, it was his second career victory and first since he won the 2016 Shaw Charity Classic, while it was the first PGA TOUR Champions win for Singh. Should Franco and Singh win again, they would be the first team to successfully defend their title since Jim Colbert and Andy North won in 2000 and 2001.